ZYD-E EX type transformer oil purifier machine is designed for petroleum industry, petrochemical industry, chemical industry, machine manufacture, coal mining, metallurgy, power plant where are easily exposed to explosion and fire, the heating system, electric equipments, electric machinery, solenoid valves are well-protected with explosion-proof labels indicative of different levels of dangers such as ExdII BT4, ExdIICT4. ZYD-E can improve the effect of de-acid, de-color and remove dielectric and acid more effectively. The value of breakdown voltage will increase from 15KV to 75KV. The performance and lifetime of insulating oil will improve and extend awfully after purification and regeneration. 1.Designed for preventing firing or exploding environment. 2.Unique water/gas removal system, which is enable to fast remove water, gas and light hydrocarbon in oil. 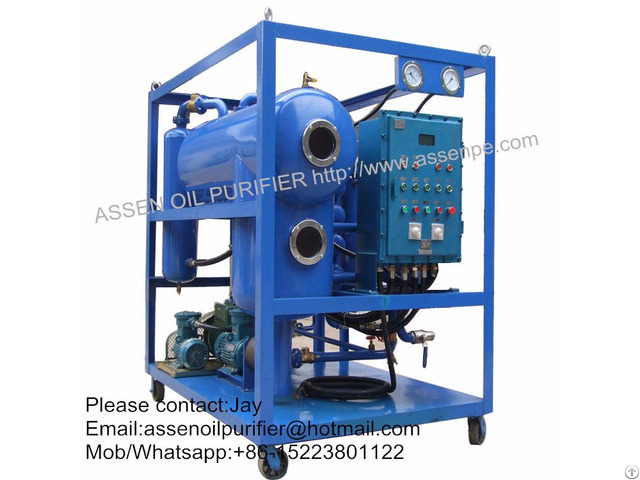 3.Precise fine multi-stage filtration helps to remove mechanical impurities in oil, Function of automatically detecting the pollution degree of filter element. 4.An advanced fully automatic temperature controlling system, liquid-level controlling system, defoaming controlling system, pressure protcting system and excellent configuration can ensure operation of the equipment with high performance. 5.Online work, allowing separated operation of manual operators from machine with lamps indicating the condition for operation. 6.It is humanization design with low noise, deep purification and long time free maintenance to save cost from the running process. 7.Chain safe protection system, pressure protection device, interaction of oil inlet ad heating, which avoids influence of incorrect manipulation. 8.Indication for changing filters, stop device for overloaded filters. 9.Stop device for electricity leakage and overloaded power to protect the motor. 10.Phase-sequence and open-phase protection, Safety control for sudden shut-down.